To put it simply, Overcasting is the act of spellcasting after a caster's spell slots are expended for the day. These rules are actually quite easy to use as long as the steps are followed in order. 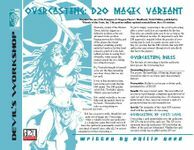 It's important to note that DM approval is required before the practice of Overcasting may be used in a game session, and it is possible that the DM will rule that only NPC spellcasters may overcast.